The Taylorville Ministerial Association received a $15,000 grant from the Duncan-Kendrick Fund from the First United Methodist Church in Taylorville for the construction of the food pantry building, as the proposed site is at 1429 East Main Cross between the Secretary of State Office building and Hillcrest Trailer Park. They recently received $269 from the Kiwanis Club to help keep stocking food on the shelves. Rodney Blomquist, Chairman of the Ad Hoc Committee for the Building Program, told Regional Radio News they need $7,000-10,000 to break ground on the building project. Blomquist further stated the ideal situation would be to start construction in late April or early May and to have it completed during late summer or early fall of this year. Blomquist added they have made forward progress as a contractor has been appointed and the design has been chosen. Blomquist noted they would like to separate the building into different rooms and have an adequate parking lot. Food and monetary donations can be made to the Taylorville Emergency Food Bank at 223 West Franklin Street in Taylorville. Citizens can also designate the donation for food or towards the building project. 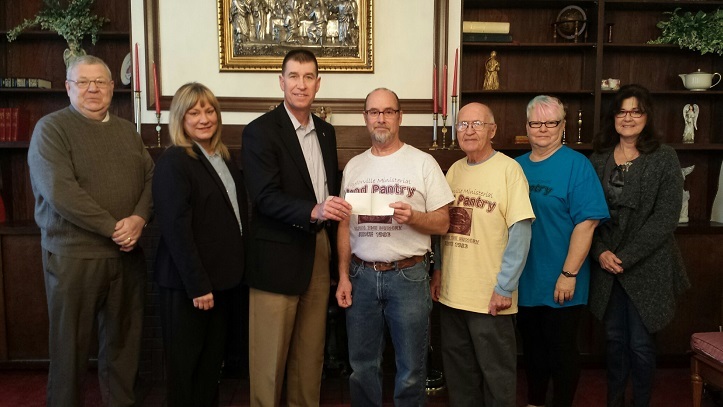 * Photo: Taylorville Ministerial Association Receives $15,000 grant from the Duncan-Kendrick Fund recently.